The green painted triangular structure in the centre of the photo below, is/was a footbridge. 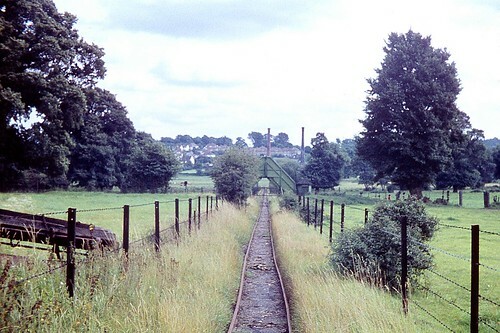 Walkers using the public footpath to and from Hamper Mill used it to cross the railway. It came from the ‘Never Stop Railway’ at the Wembley Exhibition, 1925. Wikipedia references from: Neale, Andrew (April 1992). "Coal, Chemicals and Salt. The Colne Valley Waterworks Railway". Narrow Gauge & Industrial Railway Modelling Review (Ram Productions Ltd.) 2 (10). ISSN 0958-0808.